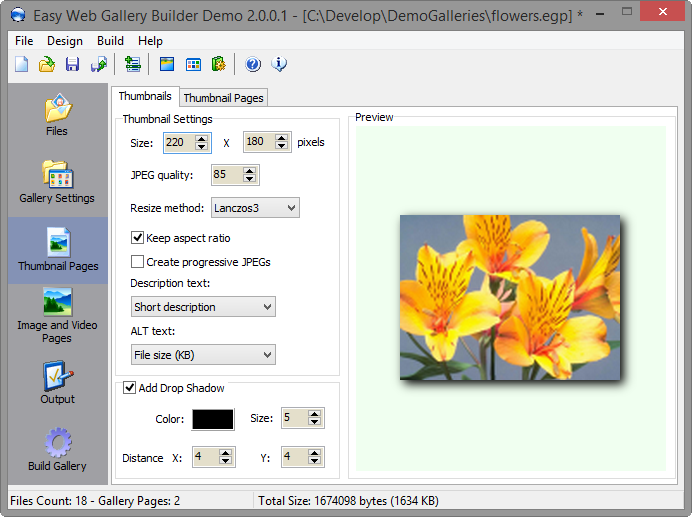 Easy Web Gallery Builder creates web gallery for local and web viewing. It saves the hassle of converting the images, resizing them and generating thumbnails. EWGB provides multiple high-quality scaling algorithms that will match even the highest demands. It supports all popular image formats and in addition to that it can process 300+ RAW image file formats. This version provides optimizations for thumbnail generation and faster image resize. It also adds a fix for the “Long Image Description” which was missing in the slideshow gallery mode. This entry was posted in Easy Web Gallery Builder and tagged Best Web Gallery, Bootstrap 4 Lightbox Gallery, Bootstrap Lightbox Gallery Demo, Create Photo Gallery Website, Css Image Gallery Code, Css Image Gallery With Thumbnails, Css Image Grid Different Sizes, Css Responsive Image Gallery, Free Photo Gallery For Website, Html Gallery Template, Html Image Gallery Code, Html5 Photo Gallery, Html5 Photo Gallery Code, Image Gallery Html Css, Jquery Image Gallery With Thumbnails And Zoom, Jquery Thumbnail Gallery With Lightbox Free Download, Juicebox Gallery, Light Gallery Jquery, Lightbox Gallery, Lightbox Gallery Bootstrap, Lightbox Gallery Html, Lightbox Image Gallery With Thumbnails, Lightbox Popup, Open Source Photo Gallery Html5, Photo Gallery For Website Free Download, Photo Gallery For Website Html Code, Photo Gallery Html Code Free, Responsive Lightbox Gallery, Responsive Lightbox Image Gallery Jquery, Responsive Lightbox Jquery, Simple Css Image Gallery, Simple Html Photo Gallery Code, Web Art, Web Gallery App, Web Gallery Of Art Citation, Web Gallery Of Art Copyright, Web Gallery Of Art Search, Web Gallery Open Source, Web Gallery Software, Web Photo Gallery Software, Wordpress Photo Gallery on April 8, 2019 by MindGems Support.